One horse neighing. Duration: 00:03. Many frogs sing near a pond in the city center. 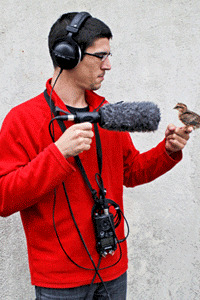 Sound recording at 2 meters. Sound of a waterfall in the background. Duration: 02:29. Cockerel crows for the first time (x4). His song will evolve until its final vote. Duration: 00:26. Neighing of a horse (x1). Duration: 00:02. Horse neighing 3 times. Duration: 00:08.